In December and January we are returning to Nepal and India for two months to continue our art and drama projects with street children and Unatti Foundation in Nepal and with the salt pan communities in India. We will also be presenting at two conferences in India. This is our third visit to Bhaktapur and the salt pans. We want to develop and deepen the relationships with these communities. In our first MAKE DO TELL project (early 2014) our aim was to immerse ourselves in Bhaktapur with the street children, in collaboration with the Unatti Foundation and Children’s Art Village, and give the children the opportunity to immerse themselves in creative practice. We believe it is important to spend time with a community if we are to develop skills and trust. We also visited the Saltpan Families who live in a very harsh environment and isolated part of the state of Gujarat India. At that time, we were only able to spend a few days with them. We were so surprised by how much of those previous visit – and the art projects themselves – they remembered. They remembered the mime and clowning routines, the colours, the songs, and the art projects. This gave us the insight into the importance of going back and committing to these vulnerable people. Going Back. 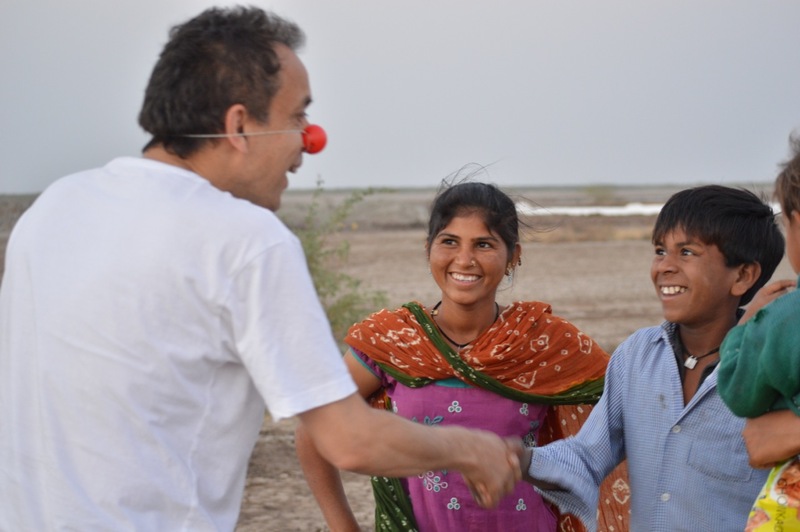 Meeting the salt pan community again in early 2014. We go into communities and teach art and drama. We teach skills. We develop imagination. We have fun. We teach students how to work co-operatively with others. And we help improve language skills. We build self esteem and self confidence. We encourage participants to learn, stretch themselves and to see and meet their potential. We believe that art and drama is a stepping stone into education which, in these communities in Nepal and India, can be informal and non-school based. Children have a right to play and to learn, we help facilitate this through fun and creativity. We believe that entrenched disadvantage should not impede children from experiencing from what we know to be good for a child’s wellbeing and future. We believe in human rights and equality, especially for girls and women; we support them by providing opportunities for them to broaden their horizons. We encourage boys and men to work co-operatively as part of a whole community where there is space and respect for all. It’s a skills based, arts and education project with the street children of Nepal. Make Do Tell – making art & theatre, being creative, learning, making childhood fun. Make Do Tell : doing drama and art together, being active. Make Do Tell : being resourceful and adaptable. Make Do Tell : Giving participants a voice through the arts. Creating stories, drama & artwork of participants’ lives. Make Do Tell : an invitation to participants to share their stories. Make Do Tell, like all our programs, is built on our experience as professional artists, research including a PhD and years of engaging creatively with disadvantaged communities. Our programs work because we are passionate about art and the role of artists in contributing to a healthy community. We are committed to nurturing the creative potential in every individual and encouraging that person to shine. Our programs work because we consult with local community organisations and leaders with whom we partner, (such as the Unatti Foundation and Children’s Art Village, Nepal, Desert Coursers in India) and we train their leaders through professional development so that the work continues after we leave. Helping feels great. We donate our arts services. Your donation helps by helping us get to Nepal and India. Your donation buys the materials. Your donation gives the children exposure to a wide range of art and drama projects. Your donation nurtures their childhood and the community and helps put in place the self-confidence that will propel participants forward. Can you make a donation? and join with other who have already supported this project? Please pass this on to others who are interested in art, education and helping communities in need. and thank you to all who have already donated. Crowdfunding is the collective effort of individuals who network and pool their money to support efforts initiated by other people or organizations. Crowdfunding is used in support of a wide variety of activities, including the support of artists and community projects. all hours via email is best. craving to learn … children in residential care.